These UV print signs with standoffs provide a complete solution for adding custom logos and graphics in a professional setting. 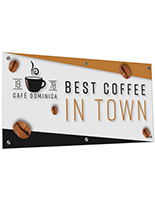 Designed to be installed behind the receptionist desk or on lobby walls, this signage package offers quality materials with high resolution printing. The UV print signs come with 1/4" clear acrylic panels in two sizes. Your custom artwork is applied directly and permanently to the rear of the panel which adds dimensionality to the overall presentation. All edges are machine polished to a mirror finish which adds the final finishing touch. 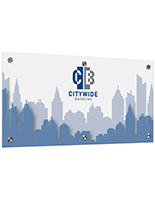 Your sign arrives with pre-drilled holes and a set of six stainless steel standoffs. In order to fabricate this professional sign, many different manufacturing steps are necessary. However, we offer all services under one roof to provide you with the best possible price.